IWM fell by 1.4%, as is usual for the week after Thanksgiving. My account fell 0.5% this week. The loss-floor has fallen to -8.7%. RYOCX: This leftover position is so small that I generally treat it as part of “cash”. 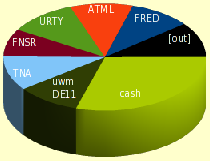 On DE 02, I received a long-term capital gains distribution which increased my account by 0.04%, which I only noticed because it made the total size of the “allocations” pie chart add up to only 99.96%. I adjusted the “cash” item to account for this additional money. UWM: Sold at Friday’s open. Bought TNA hours later for a higher equivalent price (but the TNA trade is on an hourly “leash” while UWM was daily). FNSR: Bought Thursday morning based on technical indicators as usual. After Thursday’s close, FNSR announced quarterly results: 43¢ per share, beating estimates of 30¢. The stock jumped! YHOO: Multiple “Buy” signals this week, but price never got down to my limit. Tim Knight thinks it will drop soon (because of a chart-pattern from eight years ago), but I will let my robot buy it if a suitable opportunity arises.